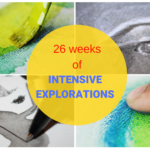 Get feedback on your art: 26 weeks of inspiration and training online class. 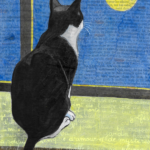 Do you want to paint and draw more but are not sure where to start or what to paint? Do you want objective feedback on your art? Then this class might be for you, it is organized in 26 unit courses that will briefly give you an assignment for something to paint of draw. This is a text and pictures based class with links to tutorials and a few videos. If you take one class a week, it will last for 6 months and if you take one class every two weeks, it will last for one year. 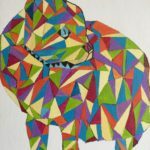 The goal is to get you inspired to draw and paint regularly as well as to try different techniques, explore different possibilities and expand your visual repertoire. Each class will show examples of art that were made using the same technique, subject or restrictions. For some techniques there will be a link to step by step tutorials. There will also most of the time be links to inspiring artists that fit the subject of the class. You produce a painting or drawing for each class and if you want to, you can share it with the rest of the class. You also have a choice of receiving a short feedback on your art from me or not. This class is for beginners to advanced artists, anyone can do it and you can choose for each week how much time and effort you want to invest in each unit. If you are looking for precise step by step instructions, then you might be more interested in the Painting Flowers from Imagination class. But if you are looking for an impulse to start creating and like the freedom to take your own decisions with a bit of guidance and feed back, then this is the class for you. For the rest of the classes, you can choose if you would rather paint or draw or even try something in between. There is quite a number of my artworks that I am not sure should be qualified as drawings or paintings. You decide how much time you want to invest for each unit. Most of the time you can do something simple like a small drawing or take more time and make a finished painting. If you complete a unit every week, the entire class will last 6 months. If you complete a unit every 2 weeks, the class will last 1 year. For most units you have a choice of media, I am using the most common supplies you will find in most artist studios. The most commonly used media in the class are Acrylic paint, watercolor, dry pastels, graphite, oils sticks. We will work on paper, yupo paper and canvas. You can see examples of supplies lists for this class here. I paint with oils, can I take the class? I work mostly with water based media but you could easily use oil painting in the class, although you have to know that most of the links to step by step painting tutorials will be with acrylic, watercolor and mixed media. 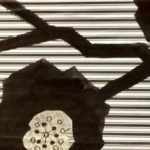 What happens once I make my painting or drawing at the end of each unit? At the end of each unit, you fill out a form where you can upload your work. To go to the next unit you need to fill out this form but can upload any picture or a blank picture if you do not wish to share your work. 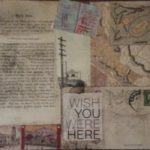 The paintings and drawings from our class participants will be shared on the blog and you are welcome to comment on them, as long as the discussion stays constructive. I am not grading the works but you can choose to receive a short feedback from me. You can choose what rhythm works best for you. I recommend you do at least a painting or drawing every two weeks to get into the habit of creating Art regularly. I recommend you do work on the units in order, as the next unit becomes available once you filled out the form at the end, although you can always skip a unit and go back to it later. I arranged the units so you get a bit of variety between, techniques and subject, drawings and paintings. This is the best gift I ever gave myself. Constantly creative, fun and with wonderful feedback. Sandrine always answered questions very promptly and was unfailingly helpful. 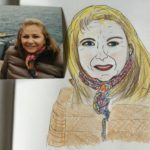 I am not a professional artist so felt more than a little intimidated for a while but her encouragement and kindness carried me though multiple facets of watercolor painting techniques. There was always a ” you can do it” feeling in her feedback as she pointed out flaws and suggested improvement,so that I always felt an excitement to keep trying. My course is now completed and I have just signed up for a new course! I simply cannot think of an easier way to access professional and inspirational artistic instruction! 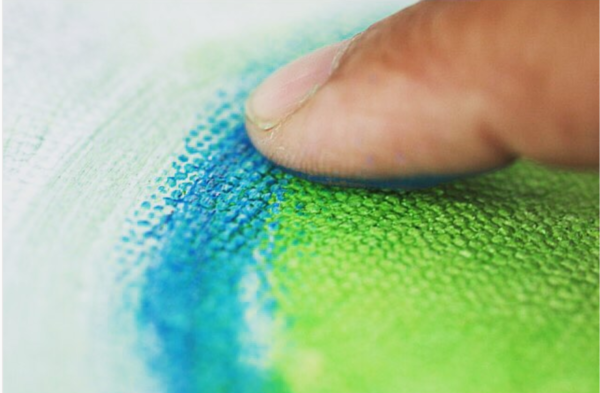 To be introduced to the many different techniques, have personalized feedback and to access the many ways others express themselves, all adds up to an amazing artistic experience. I am able to apply myself at whatever pace suits my life. The course content alone is varied and inspirational in and of itself, so will serve me beyond the year of instruction. I thank you Sandrine, for offering such a comprehensive course and your encouraging and enlightening feedback. This class has given me room to grow. 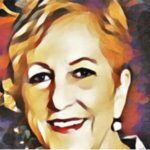 Sandrine Pelissier offers creative ideas and supportive information. How students apply their creativity is purely individual choice. The great variety of creative works that emerge from each week is testament to that. This open ended method tickles the imagination. Sandrine’s feedback, when requested, is always gentle and helpful. She doesn’t shy from making suggestions, but, always offers positive encouragement as well. About 10 weeks into the course, I found I’d developed enough confidence in some of the work I was creating to take an opportunity to show at a local gallery. That led to taking advantage of another benefit of this course. I had to stop what I was working on in week 12 to tend to matting, mounting and framing. Because the “26 weeks” course is open to students for 52 weeks, I knew I could go back and pick up week 12 in a couple of weeks and continue enjoying all the remaining weeks. So, as the title notes I’ve been “inspired to share” my good experiences with this class and to share my work with others through a local gallery. I have started the Inspiration Training only a few weeks ago. I have never attended such a good online course. Your instructions, your beautiful works and the organization of the course are really inspire me. I have never had such a busy period in my painting. I am excited to have new assignment and your instructions for it every week. Thanks, Sandrine! My rating for the course is 5/5, the best! The variety of inspirations week to week keeps me interested and challenged. I’ve already been asked to do several things I’ve never done before and I’m only finishing week 7. Looking forward to all the coming weeks. This course challenged and inspired me. The painting method videos and the feedback were the best. I only wish I had more time to devote to doing all the assignments(my fault). I look forward to following what you are doing and what new courses you may add. Sandrine is so helpful and encouraging.Each class is so varied and interesting, often topics I would never have come up with.Very inspirational. It was just what I needed to start me painting again and when time permits I’m coming back for more Sandrine! I loved this online class which I took many months ago. I actually made no less than 16 paintings which have all been exhibited – some still are. 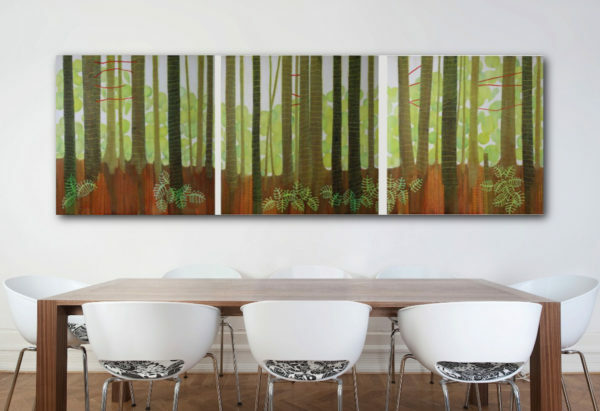 The size of the paintings are 30×30, 50×50, and 60×60 cm. I found your teaching and your method very inspiring. I “found” you via a picture in Pinterest, then went on to YouTube and ended up on your website/blog where I signed up for the class. I loved this class. I learned many new techniques, and was introduced to some new media & substrates. The videos were succinct and easy to follow. 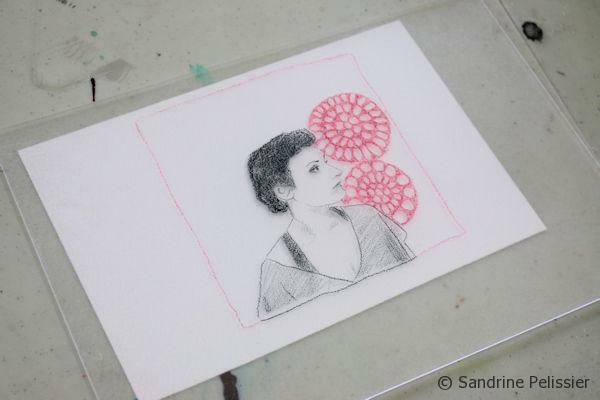 I look forward to taking more workshops from Sandrine. This inspiration to art will be with me always! 26 weeks of inspiration and training was a gift of discovery and art. I am an art dabbler who loves to “mess around” with paint, ink and paper. I was led by Sandrine to new adventures and ideas. Some were challenging and led me to question my own perception of my art. Other lessons were great new methods and examples that truly helped me learn to compose and paint. I have enjoyed the sharing from others taking the class. 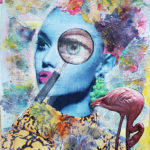 I am branching out and I am enjoying a new energy in my own art. Thanks, Sandrine, this inspiration to art will be with me always! What an excellent deal, love it. This is such a fun and challenging class – definitely takes me out of my comfort zone. 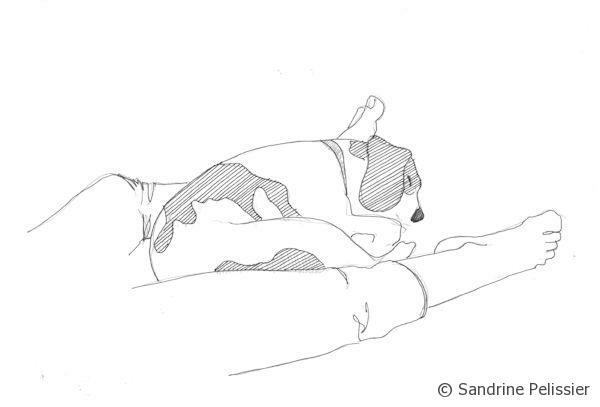 I love that Sandrine gives detailed and on-the-spot feedback when asked, the critique she sends back gives me even more ideas on how to improve or see things from a different perspective. I’ve been a big fan of Sandrine’s work for a while, and I absolutely adore her generosity as an artist and a teacher (I steal from her all the time! 🙂 ). Inspiration and instruction: There is so much to look at and learn from with each unit, because of the many links to the tutorials, which are all pretty amazing in their detail (not to mention the loveliness of the artwork). What an excellent deal, love it. Great job Sandrine and thank you ! I have really enjoyed this class so far . It has motivated me to do art more ( which is what I was hoping for ) and to explore some different techniques. I appreciate that sandrine gets back to me with her feedback usually the same day I send in my work . I find I am loosening up in just trying the different techniques which is great . The material is well organized , easy to follow and I enjoy looking at the other artists work as well. I hope to take some of her other online classes . 1. It is self-paced. Plenty of time to absorb the context of each lesson. 2. Each weeks lesson is well documented and offers the step to step instructions I need. 3. Each lesson offers inspiration from a variety of other artists on the concept presented. 4. Feedback is provided if you so wish. 5. The feedback is gentle, but constructive which as a beginner I so appreciate. It makes me want to meet Sandrine in person and take her for coffee because she sounds so cool. 6. I am trying things I never would have discovered on my own, such as ink resist, yupo paper and adding doodles to your art work. I am only on week 15 and I have so enjoyed this class. 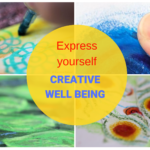 Because of this happy experience I will consider taking the next class Creative Well Being. Thank-you so much Sandrine for offering this positive opportunity to move forward with my artistic journey. Donc c’est avec plaisir que j’irai jusqu’au bout pour découvrir encore et encore..
J’apprécie ces différents modules qui nous font connaître toutes les facettes d’utilisation des mix media. Je ne suis pas encore familière avec ces techniques, il me manque un peu la folie d’entreprendre ces nouvelles façons de faire. Mais j’ai envie, je vois tellement de belles choses sur le net, notamment dans les sketchbooks. Donc c’est avec plaisir que j’irai jusqu’au bout pour découvrir encore et encore..
I’m being stretched in many new directions and I must thank you for it! 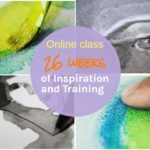 I just have to say how much I am enjoying your “26 weeks of Inspiration and Training” class. I was surprised to see that I had all the supplies I would need on hand, but I shouldn’t have been because, as I am always wanting to try new ways of painting, I pick up art supplies all the time. The problem was that I never really got around to using them. Now the pressure is on to get out of my comfort zone and I actually love it! I am loving this course! It is forcing me to think outside the box . 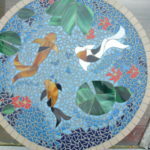 I have enjoyed working with different mediums. Right now I am working with the primary colors, this is helpful as choosing colour has been a challenge. It took me awhile to find your feedback, as it was not in my inbox, but in promotions. The advice on taking photos was helpful. Thanks, l better get back to painting! I love trying different techniques and mediums. I am really enjoying the exploration in the lessons in this class. I love trying different techniques and mediums. You are an excellent and generous instructor, thank you. If you want to expand your artistry this class can help achieve that in a short time. I am loving all that I am learning in this class. Using different media every lesson has broadened my ability to use them in my art. I can tell that working every week has made be grow as an artist and I especially appreciate the critiques that Sandrine is providing if we want her to do so. I really feel this class is an amazing bargain. If you want to expand your artistry this class can help achieve that in a short time. Thanks Sandrine. Week 1 was great. I’m glad I decided to join the course. I believe it will help me a lot. More importantly, thanks for your feedback on my work. I’m going to try your suggestion on my next work. Week 2, here I go. À bientôt! Once again, this chapter was not about the result, but about the amazing journey. Seconds turned into hours. Enjoying the class and the new ideas. Hoping to refine my skills. 26 weeks inspiration and training course is enjoyable and very useful. Sandrine has an excellent ability to teach and inspire us. It is not a step by step course when you copy the trainer’s painting. Here you follow your own ideas but you get lots of thechnical support from Sandrine. 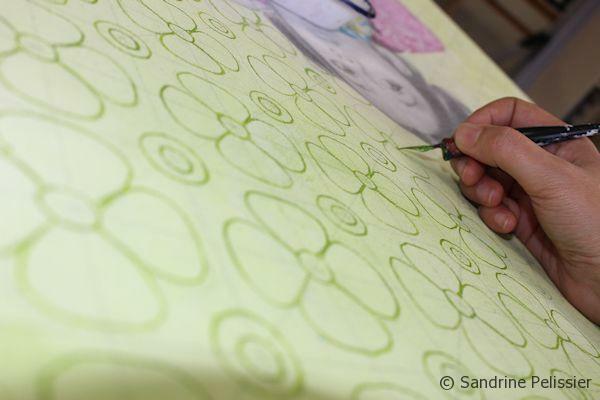 Sandrine’s personalized feedbacks on our work are invaluabe and improve our art. Sandrine’s parsonality and art are the key success factors at this course. Thanks Sandrine! I am thoroughly enjoying this class. The exercises are thought provoking and very well explained. Examples are very helpful. The exercises have pushed me to explore art in ways I would not have on my own. The gallery of other artists’ works is so helpful and inspiring. Feedback is constructive and spot on. The self paced tempo of the course is working well for my schedule. I’m excited about painting! I’m just about finished unit 2 and already feel I have learned a lot! Sandrine is sooooo kind and honest in her critique. The things she told me I could do to improve……I knew! And she told me how. I can see I will be learning a lot. 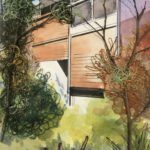 At first I couldn’t believe the course was geared to both beginners and experienced artists but was assured by a personal note that it was. As soon as I saw the first activity I realized how artfully the course had been developed. The assignment was given and then different ways it could be completed, a number of which would be comfortable for any beginner. The ones that included Sandrine’s art and methods, however, were so inviting that I was motivated to utilize a medium new to me. Granted, I wasn’t thrilled with the result, but I knew I’d learned something that I would incorporate into future works. The offer of feedback was also paramount to me and Sandrine responded with an encouraging, thoughtful, very tactful and helpful note. This promises to be the finest online class in which I’ve enrolled; it will not be money wasted as some of my previous ones have been. This class gave me a lot of food for thought. I will definitely try this technique again and perhaps add more mixed media e.g. pastels, inks etc. Fun! Tried the first one! This class was better than I expected! This class was better than I expected! I started off drawing myself in my sketch book and decided this would work best for me., so I continued. My original idea was that I would draw on canvas . I worked from a photo. I feel so stretched by the classes, I learn something from each one. My first time using yupo paper and I think I will be more successful each time.